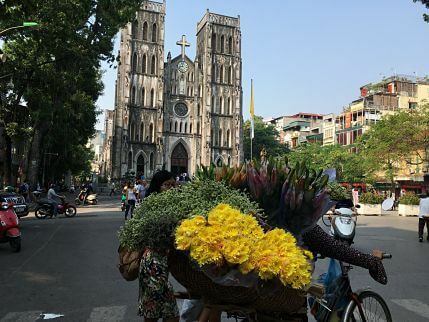 Hanoi Cathedral or St. Joseph’s Roman Catholic Cathedral, opened in 1886, is a church on Nha Tho Street in the Hoan Kiem District of Hanoi. Built in the Neo-Gothic style, it is the city’s oldest church. It was one of the first buildings built by the French colonial government in Indochina. The exterior is built of stone slabs and brick with a concrete facing and resembles the Notre Dame in Paris. The tall, fine stained glass windows made in France before being shipped to Hanoi. It features twin bell towers and faces onto a small plaza. Due to heavy pollution, the exterior has suffered significant damage over the years. The interior houses an elaborate altar and a statue of the Virgin Mary. The roof is rib vaulted, similar to those seen in medieval Europe. Mass is taken several times during the day, and large crowds attend the Sunday evening service. It is particularly impressive when floodlit at night.